THIS ITEM IS NOT AVAILABLE AT PRESENT. WE WILL NOT BE GETTING ANYMORE Star Wars Han Solo Be The Character Apron. From the Star Wars collection by ICUP. 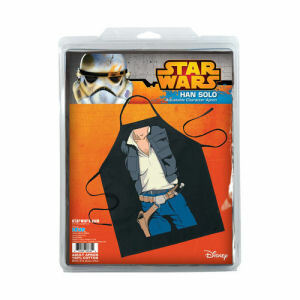 Star Wars Han Solo Be The Character Apron. You will not look like a scruffy looking nerf herder in this Barbeque Apron. One Size Fits Most! Size: 27in W x 31in H (68.5 cm x 79 cm), 24in (61 cm) neck loop, 33 in (84 cm) waist tie.